The beaches between Sydney and Melbourne number in excess of 800. There are nearly 200 surf beaches alone. Australia's beaches are renouned the world over. The beaches between Melbourne and Sydney are some of the most visited, photgraphed, surfed and enjoyed on the planet. Sydney harbour is a playground of famous coves and sandy retreats and Melbourne has its own array of places to gain respite and relax. Always look for life guards and if possible swim between the flags. Never enter the water if you cannot swim or if conditions are unfavourable. Look for turbulence and rips. This page and its contents are a guide only. , before crossing the road and settling on the sand. , celebrated for its innovative, local cuisine. Gordons Bay is a little oasis tucked between Clovelly and Coogee beaches, and is home to a 500 metre (1,640 foot) underwater nature trail, guiding divers past reefs, sand flats and kelp forests. The best lounging positions are up on the rocks, but you’ll have to get here early, this place gets packed during summer. Post swim, walk around the corner from Gordons Bay to takeaway burger joint Out of the Blue on Clovelly Road, where the fish burger is legendary. Hop on a ferry from Circular Quay to the seaside suburb of Manly, where you can swim in the ocean or tranquil harbour. Stroll from the Manly surf club along Marine Parade to access tiny Shelly Beach, a common spot for snorkelling. Manly also has great shops, a weekend arts and craft market and a dining scene that spans cheerful takeaway joints, small bars, restaurants and breweries. Sit down to the “Grande Platter” of fresh seafood at Manly Wine. , a long strip of sand edging onto a golf course, lush bushland and dunes. The southern end of the beach is more protected for swimming, and offers an Olympic-sized ocean pool with change rooms. No trip to Palm Beach would be complete without breakfast on the waterfront timber deck of The Boathouse, before a walk up to Barrenjoey Lighthouse. , a spectacular trail that winds its way along Sydney’s eastern harbour beaches. Despite being busy year-round, the beach still feels secluded with plenty of space to roll out your towel. There are three large, shaded picnic areas, as well as a café for afternoon treats. A bus also runs from Town Hall station directly to Nielsen Park. , where you can also stay the night. A five minute walk from Watsons Bay ferry wharf lies Camp Cove, a small, family-friendly beach known for its calm waters and millionaire views. There isn’t much shade here, so pack a beach umbrella if you plan on staying for the day. Camp Cove is often used as a training spot for divers, and there are good opportunities for snorkelling straight off the beach. Cold drinks and snacks are available from the kiosk. Starting the list with Melbourne’s most famous beach, the bayside suburb of St Kilda is a hotspot for visitors and is only 6 kms away from the city centre. Famous for its bustling pier, happening food scene and Luna Park attraction, bustling St Kilda is busy all year round. The beach itself is a popular spot for swimming or laying out under the sun. A 20 minute drive out of Melbourne’s CBD, Elwood Beach is a major family attraction. The beach’s sandy bay has a range of facilities to fill the day including BBQs, picnics and lawn playgrounds. Elwood’s no boating zone creates safe waters for swimming enthusiasts. For those after more activity, there are also walking and cycling paths around the coastline. A 40 minute drive from Melbourne’s CBD and named after its crescent shape, Half Moon Bay is a favourite for boating enthusiasts. Head south of the coastline to enjoy deep-water swimming zones or head to the bay’s long pier to spend the day fishing. 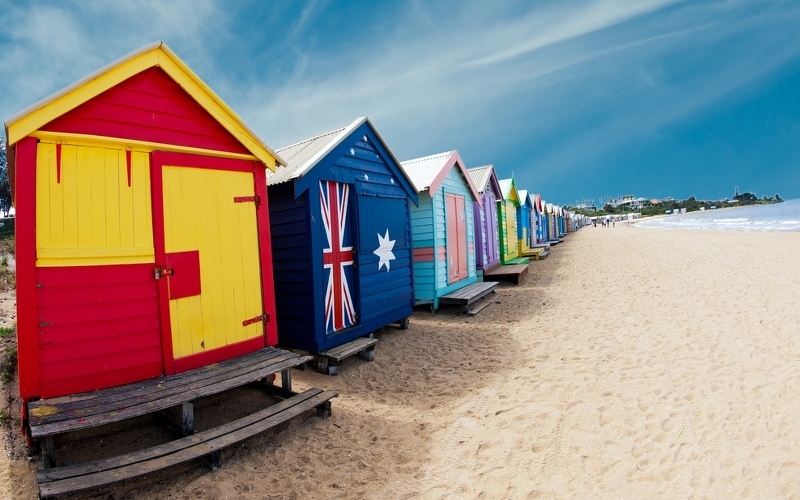 No best beaches in Melbourne list would be complete without mentioning the picturesque Brighton Beach, famous for the 82 iconic bathing boxes adorning its seaside. A 30 minute drive from Melbourne’s CBD, the colourful beach is not only a great spot for photographic novelty, it also features a 6 km coastline of pristine white sands. A tourist favourite, this hotspot is teeming with a range of restaurants and retail stores. As the name suggests, Mothers Beach is a favourite amongst locals because of its family friendly nature and safe shallow waters. An hours drive from Melbourne’s CBD, Mothers Beach is sheltered by towering cypress trees and has a number of BBQ and picnic facilities that make for a great day out with the family. 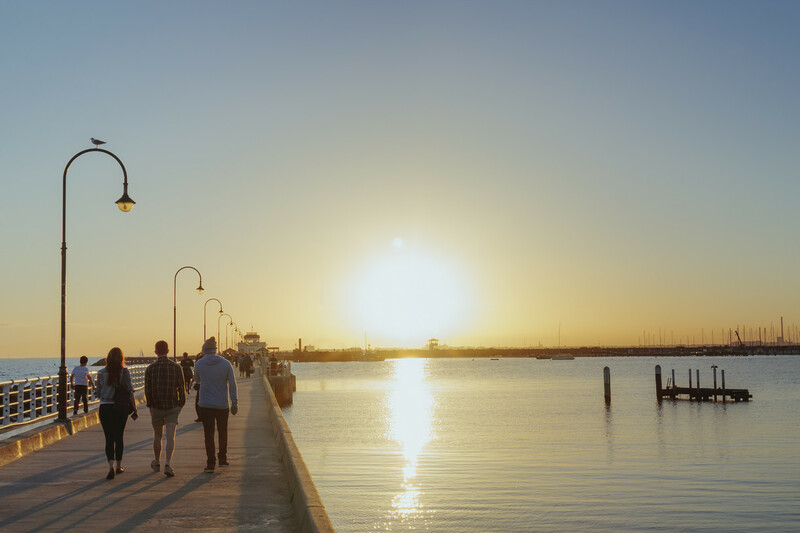 Williamstown beach is a 20 minute drive from Melbourne’s CBD and is best known for the attractive commercial precinct that sits by its coastline. Time your visit with one of the monthly waterside craft markets and enjoy a range of diverse stalls in the historic setting of Nelson’s Place. Made up of three sides of water, Williamstown is the perfect beach spot for both deep water swimmers and those who prefer to paddle in the shallows. 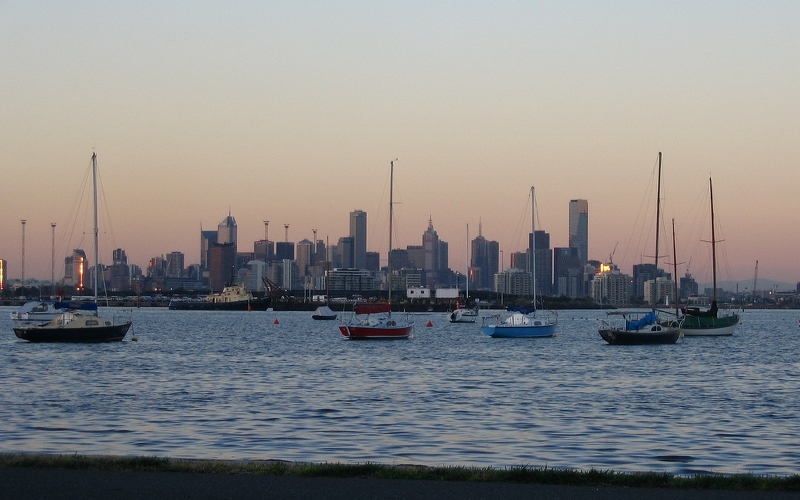 View of Melbourne CBD from Williamstown. Source: Anne Beaumont. 90 minutes out of Melbourne’s CBD, Sorrento beach is well worth the trip. 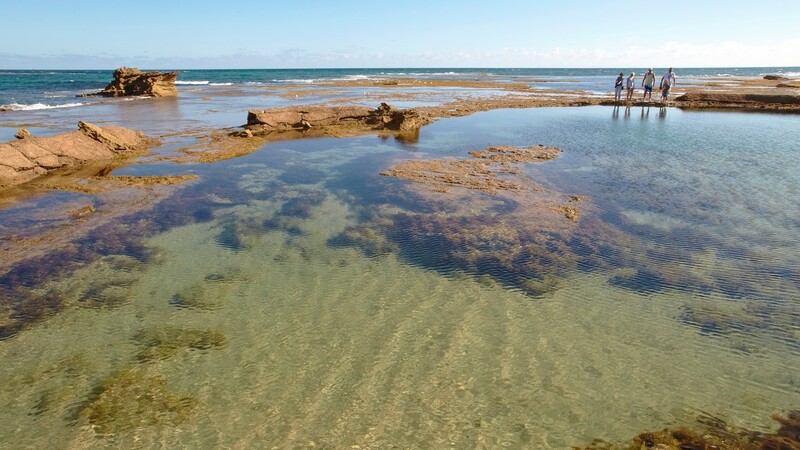 The gorgeous coastline has popular jetties, a great walking track to take in the location’s natural beauty and a number of clear water rock pools. A 25 minute drive from Melbourne’s CBD, Altona beach is a great spot if you are after a more quiet day at the beach. Once, Altona’s waters were famous for the surprising amount of seaweed it was home to. Today, with daily cleaning, Altona’s waters are cleaner than ever and make for an impressive swimming spot. A section of the beach is specifically for kite-surfing, which makes for great viewing whilst you soak in some rays. For sustenance during the day a great selection of restaurants and cafes are available at Altona Village. An hour away from Melbourne’s CBD, the Mornington Peninsula is the perfect escape for your next holiday. With an obvious nod to European coastal villages, Mornington is a boutique coastal town with a renowned regional gallery, sidewalk cafes and a number of colourful bathing boxes. With heritage architecture steeping in historical significance, the seaside town is also home to Victoria’s oldest courthouse. With numerous beaches, both sheltered and open seas, the coastal town is a popular destination for long weekends and short holidays – so be sure to book your Mornington accommodation early. The beach-side suburb of Hampton is best known for the strip of retail stores sitting on the thoroughfare of Hampton street. A 30 minute drive from Melbourne’s CBD, Hampton offers safe waters ideal for swimming along a wide stretch of sandy beach. Take a stroll on Hampton’s 17 km arts trail and celebrate the lives and artworks of notable Australian artists who have painted the beach’s coastline over a number of year. Explore the shores and make your way to the beach’s cliff points and take in stunning panoramic views. From family-friendly waters to fishing and boating havens, there is no shortage of options during your next trip to Melbourne when it comes to immersing yourself in Australia’s favourite sun-drenched past time.